I had been watching this exquisitely camouflaged spider on this Common Milkweed (Asclepias syriaca) all week. This evening I noticed it had grabbed itself some tucker and grabbed the camera. 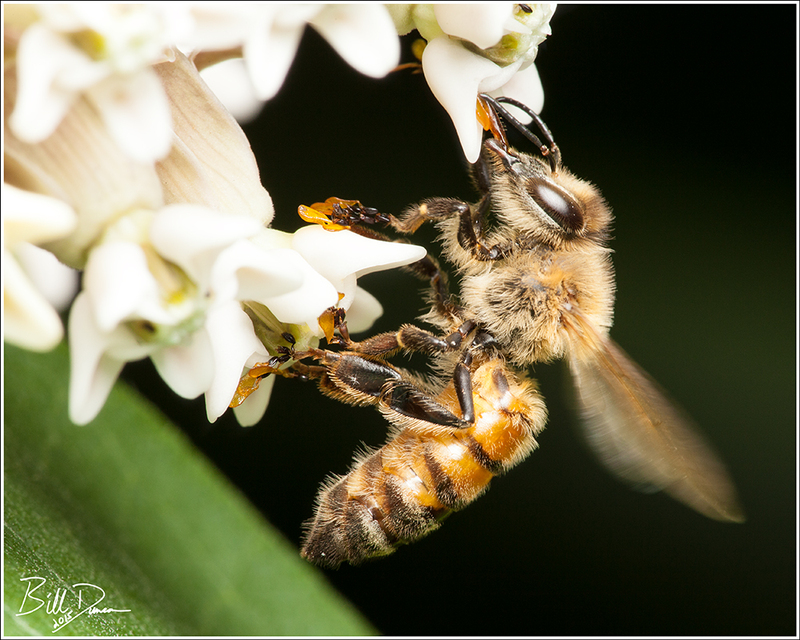 In these two photos (not the same bee) check out the pollinium (pollen sacs) that are attached to the honeybee’s legs. This is quite the interesting pollination system that milkweed use. As an insect is having a meal on the nectar the flowers provide, the pollinium attaches itself to the leg of the visitor and is removed from the donor flower. Upon removal, the pollen sack is turned perpendicular to the receptor sight, known as the “stigmatic slit” – thus avoiding self-pollination. A few minutes or so later, as the insect is visiting other flowers, the translator arms begin to dry and that flat sack of pollen now orients itself to be able to fit in this slit – thus pollinating another flower. Often, these pollinium can attach to themselves, forming long, branched chains, which may increase the chances for successful pollination. 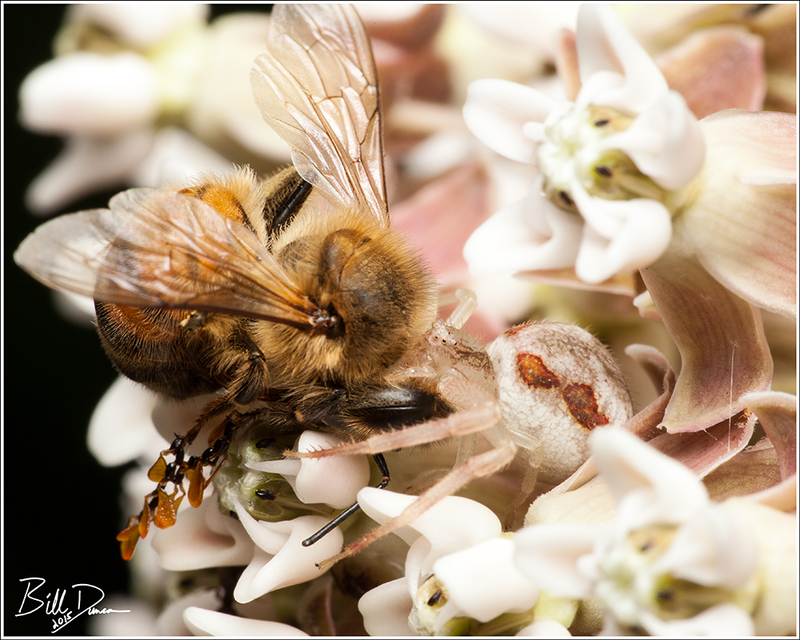 Obviously the honeybee is not the natural pollinator of milkweed, but this exotic insect is now the primary pollinator of A. syriaca and several other milkweed species. Scientists are unsure which native species were primarily responsible for this service prior to the introduction of the honeybee, or why they are not found in more abundance currently. With the current plight of both the honeybee and the monarch butterfly, it would be a wise thing to plant as many milkweed as we can in neighborhoods and in reconstructions of prairie habitats. So far my milkweed are looking good and I hope to collect plenty of seed this year (aphids really limited flower and seed production the last two years). So, if you are interested in planting some milkweed, let me know. Vary good Bill thanks for the info on the Milkweed and if you have any seeds left this year I would love to get some. Bill do you have any photos of the hummingbird moth ? We found one last year in the yard that is a interesting mouth. Bill, I’ve bought a macro camcorder and dabbled a little in filming insects (a spider taking down her web, a Praying Mantis, and bumblebee awaking in the morning on a flower), so I found these pictures riveting. In fact, I showed them to my husband, Connie. The spider’s camouflage is wonderful. I got footage last year of a funnel spider and even footage of a male leaving her tunnel after the pair had mated. I think it’s time to make that movie. Do you happen to know any fascinating facts about them? Previous Previous post: The Kingdom of Quivira – Found!